I’ve seen that statement countless times on health blogs, in parenting magazines, and on mommy boards. And if you’d asked me eight years ago — you know, before I had actual kids — I would have agreed. I’m a pretty adventurous eater, and I had no doubt my kids would follow suit. It turns out real kids are a bit different from hypothetical kids. My younger one will eat pretty much anything we put in front of him: cracked pepper hummus, spicy salsa, split pea soup, sushi, you name it. The older one, however, would subsist on a diet of Starbursts and plain pasta if we let him. I now have hands-on training in the delicate art of “encouraging” a picky eater. And I’ve found a few things that actually work — none of which require hiding spinach in a brownie recipe. In fact, this week, the picky one has eaten chana masala, andouille sausage, and grass-fed beef tacos… without complaining! Here are a few expert-approved tips that can help a picky eater expand his or her culinary horizons. 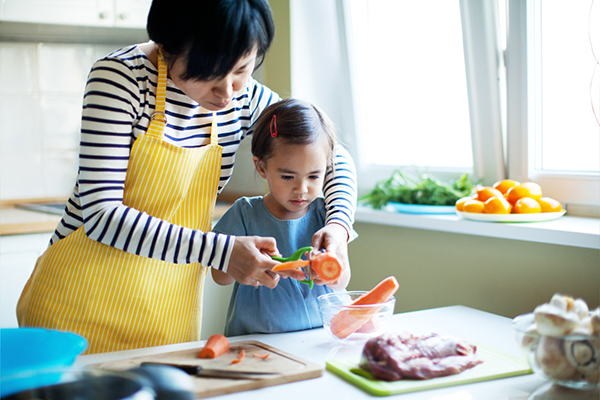 Your kid probably won’t transform into a tiny Anthony Bourdain overnight, but you can at least add a few foods to his or her repertoire, which will make mealtime easier — and healthier — for everyone. And for healthy-eating strategies, practical tips, and recipes for your whole family, check out the Ultimate Portion Fix nutrition program with Autumn Calabrese. Among the many things the program offers is a PDF of 75 Healthy Lunch Ideas for kids. Learn more about it here. While it’s normal to worry about your kid’s nutrition (that’s kind of your job!) a study in Singapore found that picky eating habits rarely affect growth. Researchers also noted that getting angry when your kid refuses a food can only make things worse. It’s OK to gripe about your picky eater with other parents, but steer clear of labels if your kid is within earshot. After all, palates can change; you might have hated Brussels sprouts as a kid, but now you order them every time you see them on a menu. Maybe your meat can’t touch your veggies. Maybe you hate the smell of cilantro. Maybe you — and by you, I mean me — can’t look at yellow mustard without gagging. Everyone has food hangups, and kids are no exception. 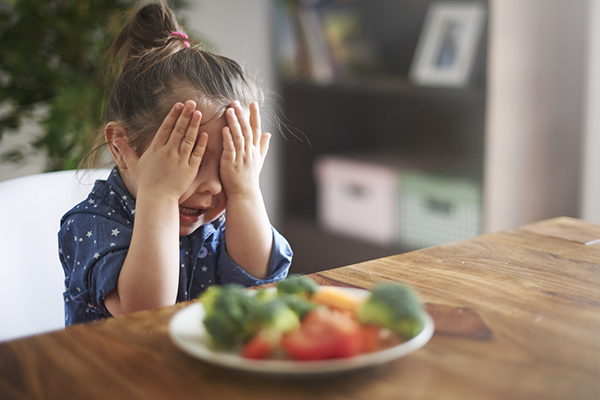 “It’s amazing to think about all of our picky eating habits and then expect children to automatically branch out,” says Amy Isabella Chalker, a registered dietitian who specializes in children’s healthy eating habits. Rather than forcing your child to eat everything on his plate, let him decide what he’s ready to try — even if it’s just a dinner roll and a scoop of corn. Fun fact: Carl Daikeler, Beachbody’s CEO and co-founder, does not like vegetables. Solution? His wife Isabelle and nutritionist Darin Olien created Shakeology so Carl would eat his greens. Don’t write off a food just because your kid tried it and hated it (or refused it altogether). Research has shown kids sometimes need to be offered a food several times before they accept it. There’s a fine line between rewards and straight-up bribery, but as a parent, you’re already a tightrope-walking master. Instead of bribing your kids with dessert — which can reinforce the idea that sweets are better than veggies — Whitney suggests rewarding with verbal praise such as, “I know, isn’t that delicious? !” or “I’m so glad you tried it!” when they sample something new. 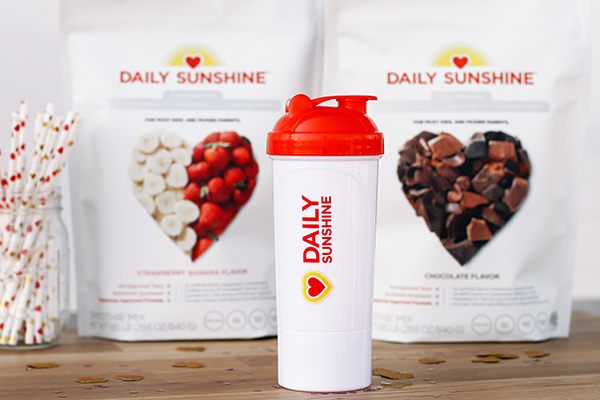 If your little ones aren’t 100 percent into fruits and veggies just yet, a Daily Sunshine shake is a fun way to introduce them to healthy foods. This shake is formulated especially for children, with a fruit and vegetable blend, plant-based protein, and healthy fats. It also comes in two familiar and tasty flavors: chocolate and strawberry banana. “It helps reinforce healthy, balanced eating, in an easy, flexible manner,” says Isabelle Daikeler, creator of Daily Sunshine and wife of Beachbody CEO Carl Daikeler. “It provides all the ingredients we know are very important for our kid’s well being and often, foods which are difficult to get him to eat! It’s important for kids to “feel included and engaged in the entire feeding process, from beginning to end,” Chalker says. But she cautions against lecturing them about calories and vitamins. Instead, focus on making it fun: Challenge them to find a fruit they’ve never tried in the produce aisle, or ask them to help crack the eggs when you’re making quiche. “It’s beneficial for children to observe these healthy habits, understand the food cycle, and connect to their food in an educational way,” Chalker adds. “Rather than going head-to-head with your kid, talk about what he’s missing out on: ‘You don’t want this delicious shrimp? More for me! '” Whitney says. Or chat with the rest of the family about how yummy it is. You know how kids will ignore a toy until they see someone else playing with it, and suddenly they need to have it right this second? Same principle. Obviously, peer pressure is the worst — but it’s also a totally useful parenting tactic, and sometimes you gotta do what you gotta do. Sure, it’s annoying when your kid eats three applesauce pouches a day but refuses to touch an actual bowl of applesauce. But presentation plays a big role in kids’ perception of food. A study at Stanford University found that when kids were presented with two versions of the exact same food — one in a McDonald’s wrapper, and one in a plain wrapper — they gave the Mc-e-Dee’s grub significantly higher ratings. Get thee to a Pinterest board and get fun presentation ideas like serving up cucumber boats or reindeer sandwiches to make healthy eating more fun. When your kid rejects a piece of bread because the crust is “too crusty,” you might assume anything more adventurous would be out of the question. The same kid who won’t touch certain shapes of pasta might devour a plate of pad thai with spaghetti squash. You never know until you try — and worse case, at least you’ll enjoy the leftovers.